The PC-based oscilloscope is a simple idea. The instrument consists of hardware and software layers. The hardware is a small module that plugs into a PC’s USB slot. The complete oscilloscope also makes use of a modern desktop computer which works in conjunction with the proprietary module. I have used two PC-based oscilloscopes, one from Oscium, and the CircuitGear CGR-201. They are both endowed with awesome functionality (Math, FFT, and so on) at prices that students can afford. The Oscium unit was reviewed in a previous Test and Measurement video. It is specifically designed to work in conjunction with Mac IPad, IPod or IPhone. The CGR201 connects to either a PC or Mac computer, either of which can use various operating systems. Instructions for downloading from the internet, and installation instructions for the requisite software, are contained in the operating manual, available free from the Syscomp website. Anyone can download the manual and the software, regardless of whether the instrument has been purchased. Three electronic instruments are included in the Syscomp CircuitGear CGR-201. They are a two-channel digital oscilloscope, a waveform generator, and a digital input-output port. Additionally, a spectrum analyzer and a vector-network analyzer (Bode plotter) may be accessed, using software that has been downloaded into the host computer. The Three-Part CGR-201 PC-Based Oscilloscope Control Panel. When the platform-appropriate software has been downloaded from the Syscomp CircuitGear website, the application shows up on the computer desktop, and it can be opened by double-clicking on the icon. The initial window that appears on the computer screen upon opening the CircuitGear application is made up of the three segments that correspond to the three aspects of this PC-based instrument. The Syscomp CGR-201 connects to the computer via a standard USB cable. Once physically connected, a box highlighted red in the menu bar above the oscilloscope panel informs the user that the instrument is disconnected. To connect, with the module plugged into the computer, in the menu bar, click on Hardware and then on Connect. The Port Settings box appears and the user is instructed to select a port. The default button that is checked is Show Available Ports. However, no ports are listed! The remedy is to toggle between Show Available Ports and Show All Ports. Then, a port will appear when you click back on Show Available Ports. Click on the port that is available, so it is highlighted. Then click on the box at the bottom to connect. Now, the module has successfully connected to the computer, as indicated in the green box at the top. (It is not necessary to have a probe connected to the module). When the CGR-201 module connects to the computer, with no probe connected to the module, the appearance of the horizontal line coinciding with the time axis changes perceptibly. A slight quivering of the trace is seen. This is because with the module connected, we are seeing a signal of zero volts amplitude. 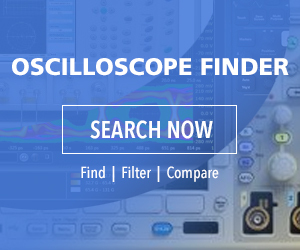 With the oscilloscope sensitivity set high, the noise floor that exists in any conductor or device due to thermal particle activity becomes visible. Like all modern oscilloscopes, the CGR-201 PC-based instrument makes use of triggered sweep to produce a stable display of recurring waveforms. The instrument is a dual-channel 40 MS/sec oscilloscope with 10-bit analog-to-digital conversion. The two channels are sampled simultaneously and stored in memory prior to transmission for display in the host computer. This means the two signals are time aligned and based on the same trigger event. The oscilloscope section of the control panel includes controls so the user can select Mode (Auto, Normal, Single-shot or Manual), Source (Channel A or Channel B) and Slope (Positive or Negative). The triggering time can be adjusted by the user by means of an on-screen cursor to display the signal before and/or after the trigger event. On the probes are slide switches so the user can choose between 1X and 10X attenuation. This setting should be coordinated with the Probe Setting, which is found under Options of the relevant channel in the oscilloscope Control Panel. In the Oscilloscope Section of the Control Panel, each of the two channels has plus and minus controls whereby the user can adjust the vertical amplitude scale. The current volts-per-division is shown in a small graphic above these controls. The default level is 1.0 V/div and available settings are 2.0 V, 5.0 V, 500 mV, 200 mV, 100 mV, 50 mV, 20 mV and 10 mV. Below each of these controls for each channel is a list of options that, as in most oscilloscopes, includes a choice of ac or dc coupling, the ability to Hide or Invert a waveform — which can be used in conjunction with Math — and the probe options mentioned above. To the right of the oscilloscope display is the timebase subsection, with plus and minus controls that let the user adjust the sampling interval. The default is 1 msec. Choices are 2 msec, 5 msec, 10 msec, 20 msec, 50 msec, 100 msec, 200 msec, 500 msec, and various longer and shorter intervals. Under Options, Trigger Source (Channel A or Channel B) and Trigger Slope (Rising or Falling) may be selected. This is similar to a typical bench-type or hand-held oscilloscope. As Source and Slope are selected, the diagram at the top change to reflect the current status. The Waveform Generator to the right side of the panel lists available waveforms, and clicking one displays it in the thumbnail above. Also in this panel, amplitude, offset and frequency can be set by using the mouse to move the sliders or by typing in values. The Waveform Generator has the additional capability of producing arbitrary waveforms as specified by the user. The digital Input-Output control panel facilitates digital measurements, which are useful in prototyping and also troubleshooting equipment that is in failure mode. There are input and output ports, each eight bits, controlled and displayed in the graphical user interface. There is also a pulse generator output, with adjustable frequency and duty-cycle parameter. This section is valuable for educational demonstrations and self-directed exercises, as well as for discovering which stage, circuit or component is faulty in malfunctioning equipment. The CGR also includes a Vector Network Analyzer (Bode Plotter). This instrumentation is used to operate the oscilloscope and waveform generator simultaneously to sweep a network across a given frequency span so resultant amplitude and phase readings can be recorded. A spectrum analyzer mode display on the CircuitGear scope. The included Spectrum Analyzer is useful in many applications. Using Fast Fourier Transform (FFT) algorithms, the frequency domain graphic representation of a signal is shown along with the time domain representation from which it is derived. The information contained in the two displays is the same, but the user gains different insights by viewing the separate domains. The CGR-201 PC-based oscilloscope is a highly competent, serious instrument that is of great merit for students and researchers, and given the fact that everyone has a computer, the space required and price of the module are both modest.